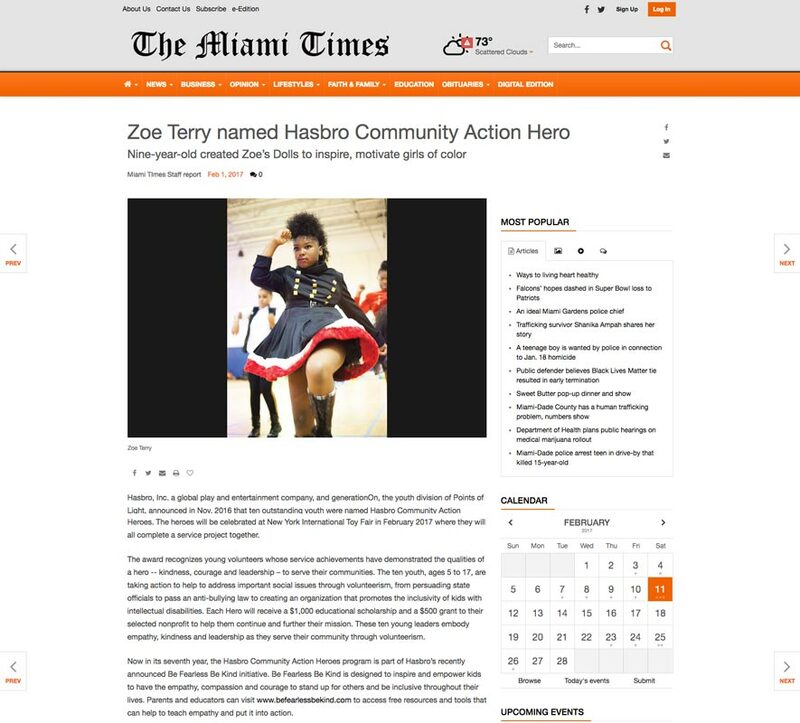 More news about Zoe receiving the Hasbro Community Action Hero Award! The Miami Times published this article on February 1, 2017, in the Family News Section. Hasbro, Inc. a global play and entertainment company, and generationOn, the youth division of Points of Light, announced in Nov. 2016 that ten outstanding youth were named Hasbro Community Action Heroes. The heroes will be celebrated at New York International Toy Fair in February 2017 where they will all complete a service project together. The award recognizes young volunteers whose service achievements have demonstrated the qualities of a hero — kindness, courage and leadership – to serve their communities. The ten youth, ages 5 to 17, are taking action to help to address important social issues through volunteerism, from persuading state officials to pass an anti-bullying law to creating an organization that promotes the inclusivity of kids with intellectual disabilities. Each Hero will receive a $1,000 educational scholarship and a $500 grant to their selected nonprofit to help them continue and further their mission. These ten young leaders embody empathy, kindness and leadership as they serve their community through volunteerism. Now in its seventh year, the Hasbro Community Action Heroes program is part of Hasbro’s recently announced Be Fearless Be Kind initiative. Be Fearless Be Kind is designed to inspire and empower kids to have the empathy, compassion and courage to stand up for others and be inclusive throughout their lives. Parents and educators can visit www.befearlessbekind.com to access free resources and tools that can help to teach empathy and put it into action. Violet Humble, age 8, Spokane, WA: Violet wanted to see kindness ripple, so she rallied family and friends to help the homeless population of Spokane. In the past year, she assisted nearly 250 homeless people per week by distributing thousands of toiletries and snack bags, serving 900 meals and raising over $4,000. Hailey Richman, age 9, Long Island City, NY: Hailey founded Kid Caregivers, a support group for kids who are assisting their families in caring for a loved one with dementia. Kids as far away as Russia, Germany and Africa participate. Hailey is also the assistant director of Puzzles to Remember, where she distributes puzzles and volunteers her time to help seniors with dementia. Zoe Terry, age 9, Miami, FL: After being teased and bullied in kindergarten, Zoe created her own organization called Zoe’s Dolls at age 5 to inspire and motivate girls of color to know their image was beautiful. Since launching Zoe’s Dolls, she has donated more than 2,000 dolls of color to girls in need. Paloma Rambana, age 10, Tallahassee, FL: Paloma, who is legally blind, recognized a critical gap in services for visually impaired 6-13 year olds in Florida. She led two rallies at the Capitol and lobbied the Florida legislature, who approved more than $1 million in funding for Florida’s blind and visually impaired 6-13 year olds. Morgan Guess, age 13, Paducah, KY: At age 8, Morgan was bullied and started to become withdrawn and depressed. She decided to take action and be part of the solution by starting Guess Anti-Bullying to support other kids experiencing the same issue. Aidan Thomas Anderson, age 15, Woodstock, GA: Aidan’s love of music inspired him to realize he could make a difference after donating the tips he made playing his harmonica to help kids in Africa get much-needed medications. Zachary Rice, age 14, Long Valley, NJ: After being diagnosed with a rare degenerative bone disease, Zachary realized playing video games helped distract him from pain. Now he hosts the “Action for Distraction 5K” to help donate gaming systems to children’s hospitals. Angelina Zevallos, age 17, Berkley, CA: Leading a community project called “Youth Voice Activate,” Angelina recruited more than 30 youth to create awareness about the crisis of homelessness in the Bay Area. She also helped collect and distribute more than 150 care packages to homeless families and feed more than 350 homeless individuals. Eden Duncan Smith, age 17, Brooklyn, NY: As a Broadway and big screen actress, Eden is taking advantage of her increasing fame to help shine a light on civil rights and become a voice for others, especially for the LGBT community and young women of color. Josh Kaplan, age 17, Phoenix, AZ: Recognizing that kids with intellectual disabilities are often isolated socially, Josh created GOALS (Giving Opportunities to All who Love Soccer), a nonprofit Unified Soccer Program for kids with and without special needs to help build a forum for positive social interaction between the groups. Since the program was first established in 2010, 50 youth have been recognized and celebrated as Hasbro Community Action Heroes. generationOn provides programs and resources, like the Hasbro Community Action Heroes, that support the development of caring, compassionate and capable kids and teens through service, empowering them to become changemakers in their communities and the world.